Outside Dimension vs. Inner Dimension? The outside dimension is demonstrated in the picture on the left. It refers to the width and height of the entire picture frame. In other words, it is the amount of room that your frame, display case, or framed mirror will take up on your wall. The inner dimension is demonstrated in the picture on the right. It refers to the width and height of the opening taken from the back of the frame. This is where your artwork or whatever else you may be framing will go. Thus, if your picture that you want framed measures 8x10, then you should order a frame with an 8x10 inner dimension. Can I get a custom frame made? Yes. We can make custom sizes, and even custom finishes, depending on your needs. There will be a setup fee for custom orders. Please call one of our frame specialists at our toll free number to discuss your custom frame needs. 1-877-576-1888. What if I order the wrong size frame? Note: Frame colors may var. Unfortunately, we cannot guarantee the color of your frame because of differences how different monitors display colors. We do guarantee the quality of workmanship in all our products. ** Custom orders (glass, frames, shadow boxes, and mats) cannot be returned. Do you have mats to fit your frames? Yes. We can custom cut a mat to fit any of our frames. We will make the mat to your exact specifications including multiple openings or no openings at all. This is very good for backing on floral displays or collectible displays. We carry high quality acid-free mats in a number of colors. Please call one of our frame specialists at our toll free number for help with your mat. 1-877-576-1888. What kind of glass should I order? 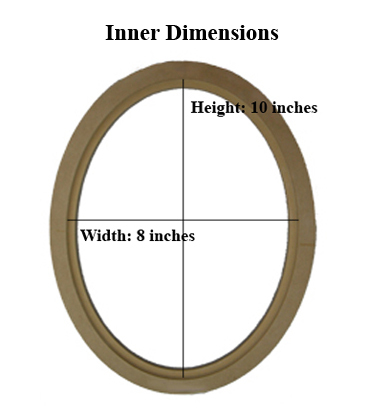 Victorian Frame Company carries flat glass and convex glass to fit all of our picture frame sizes and shapes. Convex glass will give your project a Victorian look. Most pictures framed before 1940 used convex glass. Some of our customers like using convex glass even if they are not going for the Victorian look. If you are framing a canvas, you might not want to use glass at all. If you are framing/displaying something that is more 3-dimensional than a photo or canvas, an acrylic dome may be what you need. There are an infinite number of items that can be creatively displayed using an acrylic dome such as: preserved wedding bouquets, precious keepsakes, and prized memorabilia. We carry domes to fit all of our frame shapes and sizes. Our domes are available in a variety of depth including some up to 7 inches deep. Questions about convex glass or acrylic domes? Please call one of our frame specialists at our toll free number 1-877-576-1888. Can I get non-glare glass? Yes. We can get non-glare flat glass in most sizes. Please call for availability and pricing. 1-877-576-1888. Do you carry rectangular frames? Yes. 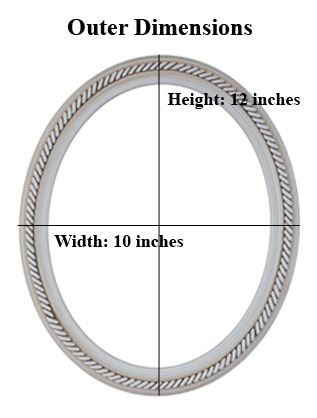 In addition to oval frames and round frames, we carry rectangle frames (with rounded corners), octagon frames, oblong frames, hexagon frames, and cathedral frames. We also carry fan-shaped and heart-shaped frames. We pride ourselves on having the largest selection of picture frames of different shapes. We also have glass (flat glass or convex glass), mirrors and acrylic domes to fit almost all of our frames. What if I don't want to hang my frame on the wall? Instead, I want it to stand on a table. Do you have frame backs with stands? Yes. Easel backs are available to fit oval frames that are 8x10 or smaller. Please call our toll free number to learn more about easel backs. 1-877-576-1888. Are there any discounts if I order more than one frame? Yes. We value your business and will give you a discount if you order more than three of the same identical frame (size, style, and finish) all shipped to the same address. Please email or call us with your choice of frame style, size, finish, and quantity to get a quote. In addition, we offer a selection of in-stock picture frames at a discounted price of 50% off. This selection is always changing. We accept Visa, MasterCard, Discover, American Express, and PayPal. How are the items shipped? Orders will be shipped by UPS Ground within two weeks. It tends to be very expensive to ship orders outside of North America. AS a result, we generally don't accept orders from Europe, Asia, and elsewhere. However, we will quote you international shipping rates if you are interested. Do you share email or other information about your customers with other companies? Absolutely not. We respect your privacy and will not share your personal information with any third party. Please email us your questions or call one of our frame specialists at our toll free number 1-877-576-1888. We're here to help!